1. Take a 12" x 12" sheet of scrapbook paper (preferably double sided) and bring two sides together, wrong sides facing and stitch a seam along one edge making a tube. 1. Trim white card to measure 15 x 21 cm and fold in half to make the base card. 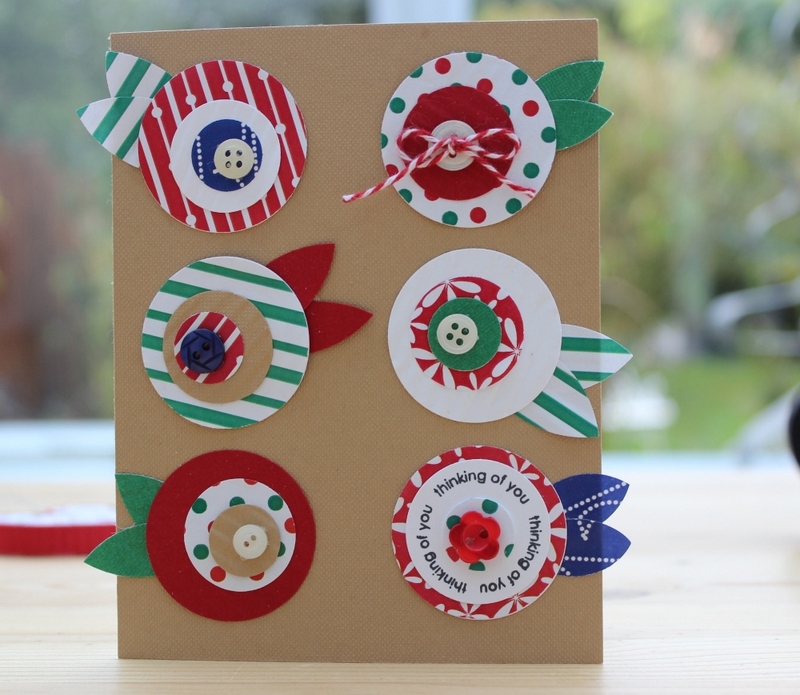 Create six stylised flowers with circles cut/punched from card/paper and layered with a button in the centre. Take a strip of card 4 cm wide and 30 cm long, stick a narrower strip of patterned paper in the centre, score at 0.5cm intervals along its length and concertina fold. Join the two ends together with tape forming a ring, flatten in the centre and secure with a circle of card and strong glue. 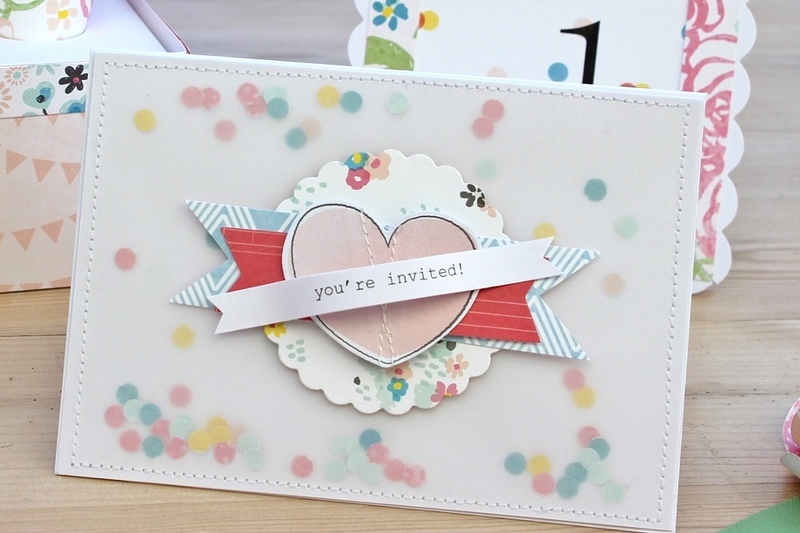 Add ‘no1’ to a circle of card and stick to the centre of the rosette. MFT Die-namics Rolled Rose die. 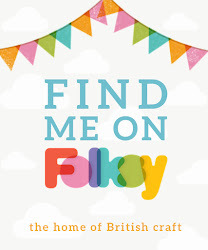 This Sizzix one is similar and as cheap as chips! Cover the 12 x 15 cm card blank with silver glitter card and then mat and layer with black and ivory card leaving a narrow border between each layer. Trim white card to measure 28 x 9 cm and fold in half to make your card blank. Cut a 9 x 14 cm rectangle and 2 ovals from brown card, make a small flap at one end of each oval and glue them to the back of the rectangle. Adhere this to a 10 x 15 cm top fold card blank. Cut a square of white card 20 x 20 cm. 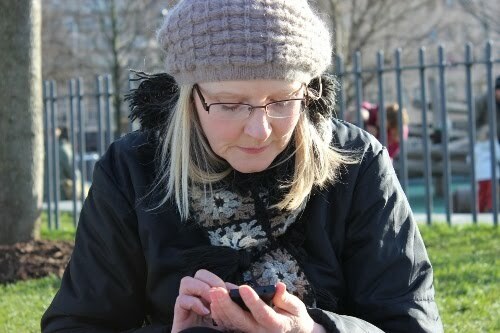 Then score at 6cm on all four sides. American Crafts Glitter paper pad 6 x 6"
Cut a panel of white card to 14 x 14 cm, round the corners with a punch and stick to the centre of the card front. 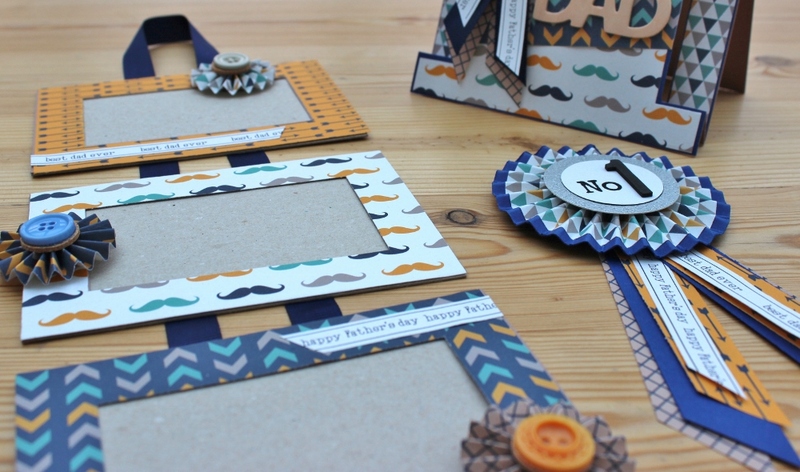 Die cut the 'Happy Birthday' sentiment from black card, cut around the remaining card and place on the card front. Make 6 different coloured triangles from glitter paper and stick them around the sentiment as shown. To make the triangles stick the glitter paper to a double-sided sticky sheet before cutting out a 2" square using a craft punch, then cut the square in half making two triangles. Next week's make will be this gift box and paper bow. Take an A6 (10.5 x 14.8 cm) tent fold card blank and fold the front panel in half. Now adhere the ‘antique chair’ paper panel to a 10.5 x 14.8cm piece of card and add a stamped greeting and a border sticker near the top edge. 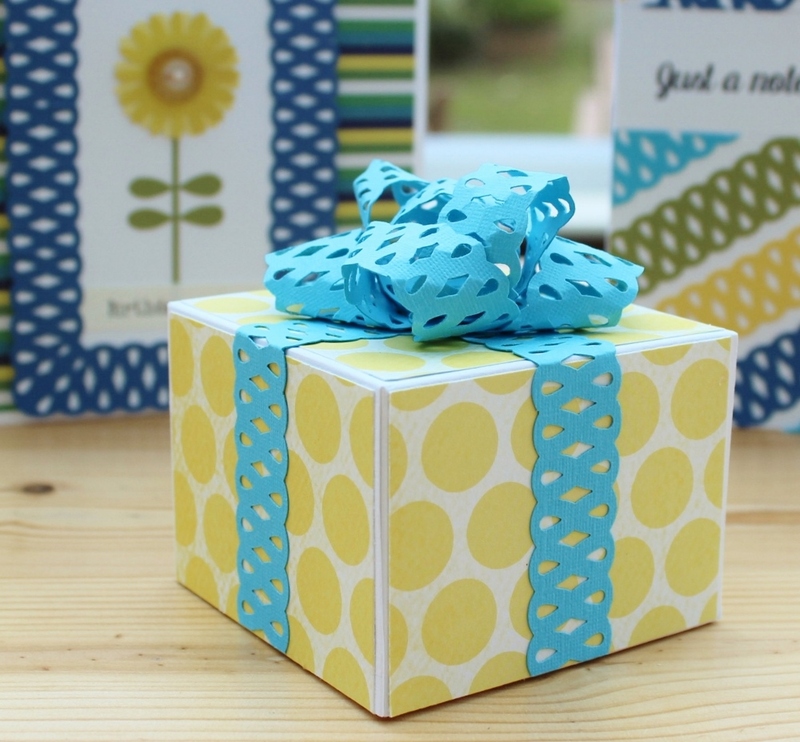 Make three rolled paper flowers and secure them to the card panel together with 2 leaves cut from corrugated card. Stick the panel to the bottom section of the folded front of the card blank. Cover the inner panel with paper and glue a button/brad in the centre to support the easel. 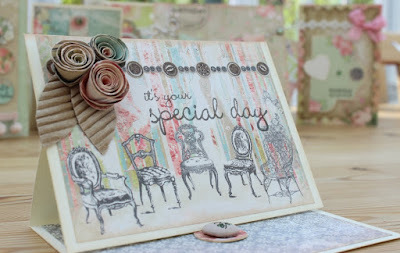 For more card inspiration using this paper collection check out my home sweet home card here . 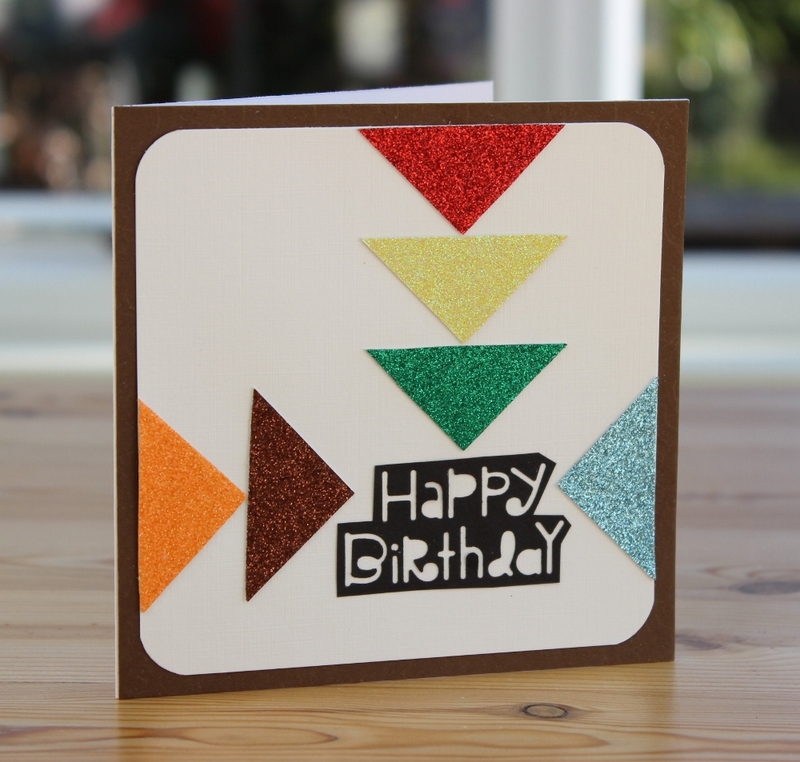 Next week we'll be having fun with glitter card with this bright and funky 'scrap buster' card. Continuing in the quick and easy crafting series, Here's a simply stylish gift bag that you can easily make with minimal supplies, what's not to like! 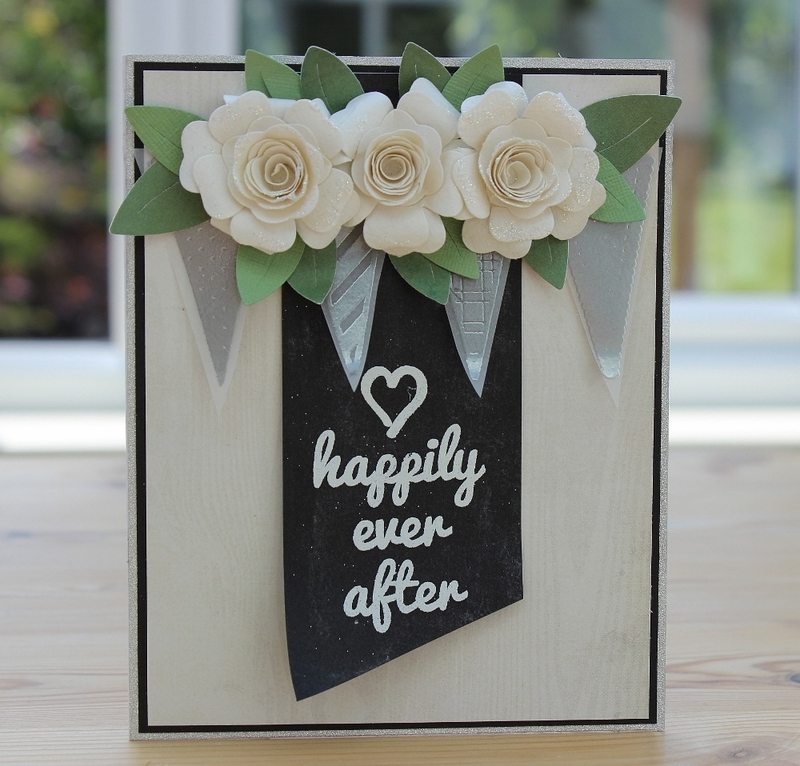 Make the base from card, cut to 16 x 12 cm, score all sides at 2 cm and snip a fold at each corner to make flaps and add glue to form a shallow box. Now cut two 14 x 21 cm pieces of paper and glue the bottom edge around the front and sides of the box, repeat on the back of the box and add glue to the overlapping side seams. Make two handles from pink card cut to 1.5 cm x 18cm and secure each end to the front and back of the bag with decorative brads. 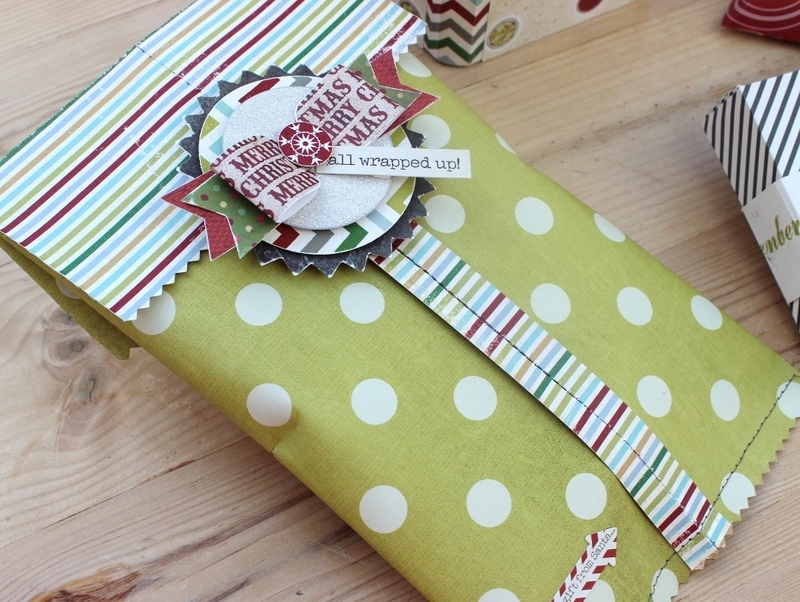 For the tag cut out a circle topper with a circle punch or die, back with white card and tie to the handle with twine. I'm starting a weekly series of quick and easy, greetings cards and gift bags to help kick start your crafting mojo and get you organised for the year of Birthdays ahead. 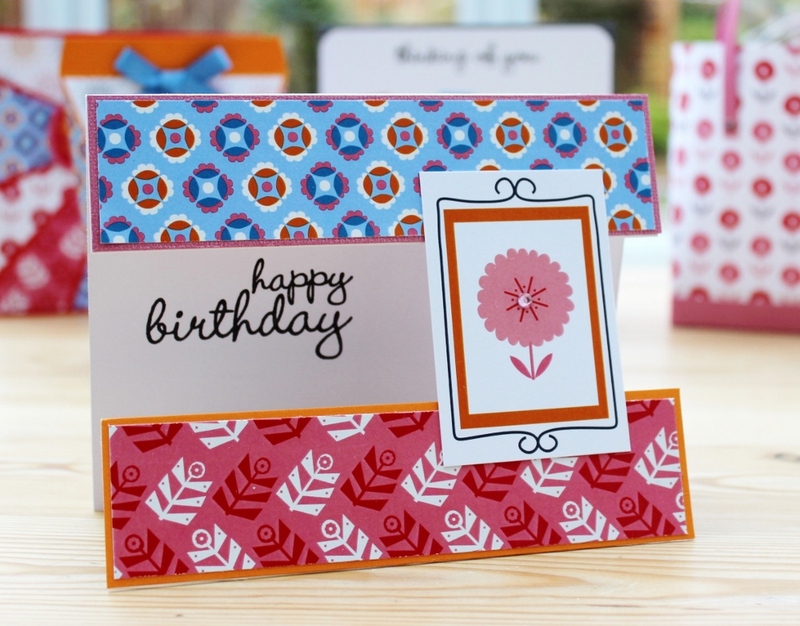 The first make is this bright and funky, simple and effective Happy Birthday 'gap' card. Cut white card to measure 15 x 16 cm and score and fold the long side at 4 cm. Cover the 4 x 15 cm panel with pink card and layer with a slightly smaller panel of patterned paper leaving a narrow border. 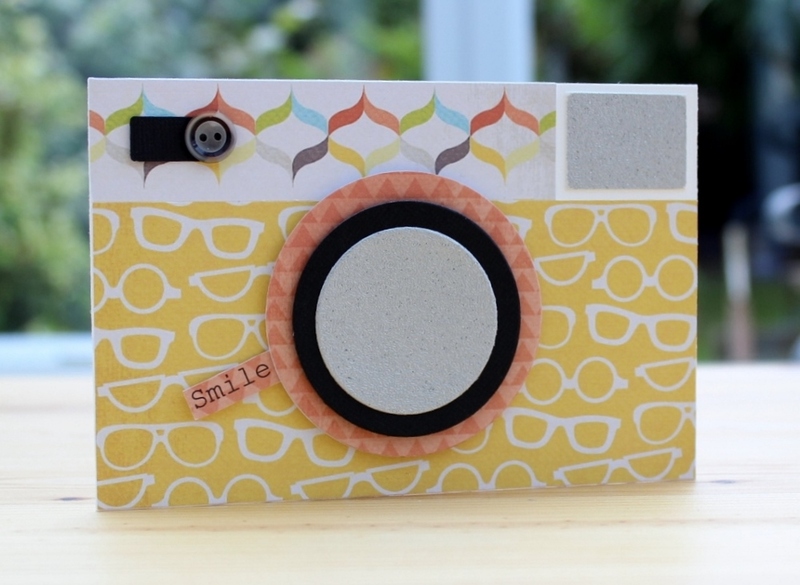 Cut out a topper back it with white card cut to 7 x 4 cm then attach it to the right hand side of the paper covered panel. Now for the foot of the card front, cut a rectangular of card 4 cm x 15 cm cover with orange card and paper as before and glue it to the reverse of the topper taking care to line it up with the back of the card. 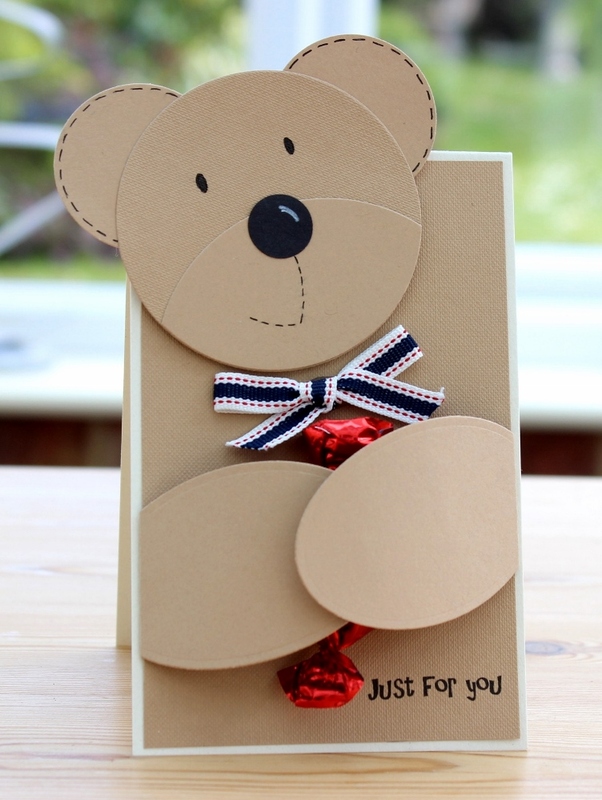 Finish by stamping a greeting in the 'gap' on the inside of the card. 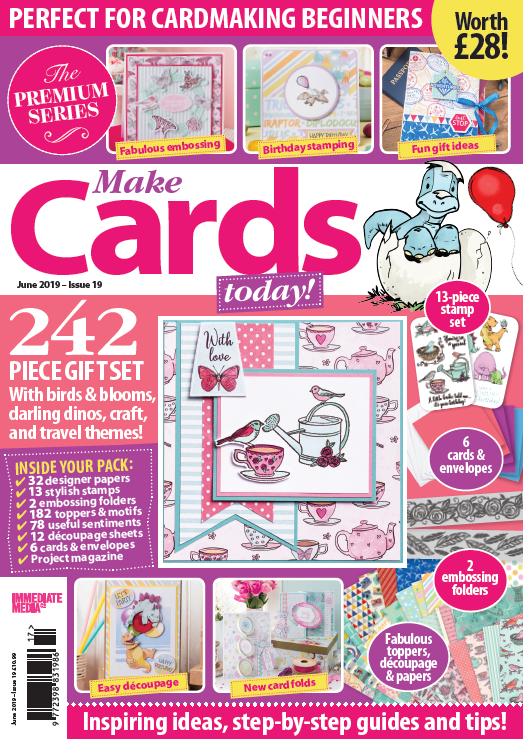 Papers and toppers are readily available as free gifts in craft magazines or as free downloads from craft magazine websites, like these pretty floral papers from Papercraft Inspirations, or these Cottage Garden papers from PaperCrafter. 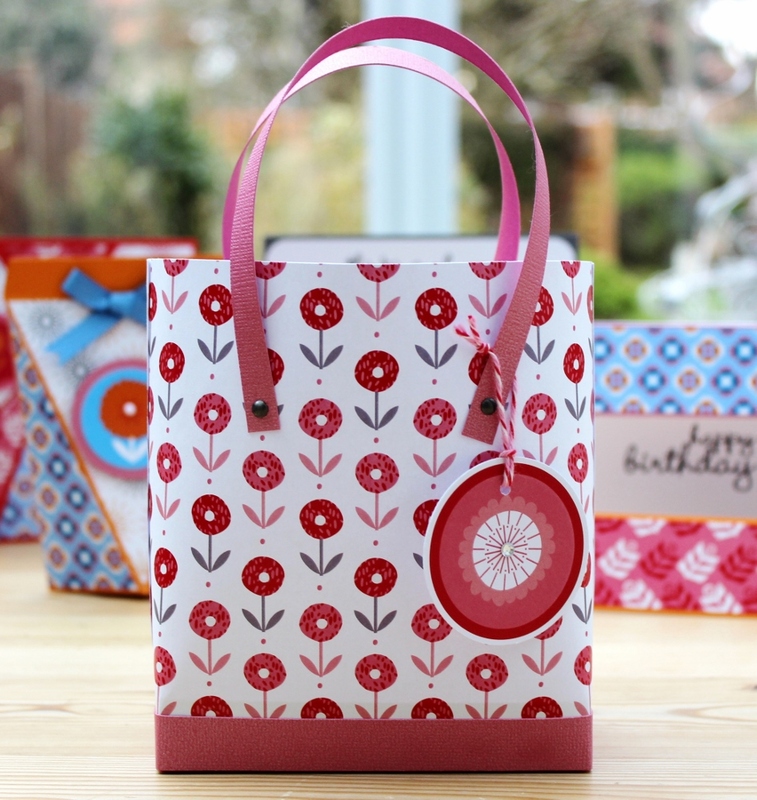 Next week's project will be this simply stylish gift bag!